Sitting out on the patio over the last month, I've been getting tired of seeing rats running back and forth along the fence in the backyard. I figured, what a kick to put a rat trap right on the top of the fence, and catch one of these rats as they're running along the fence. Of course, Murphy is alive and well, so invariably, when the trap went off, it was going to fly into the neighbors yard. They're a little weak in the English department, so trying to explain to them that there's a dead rat in their backyard, and that it's mine, and that I want it back seemed like it would get confusing. Being the engineer that I am, the solution was simple; staple some wire to the trap and the fence, so it can only shoot in our direction, and then it wouldn't fall on the ground for the dog to get into, etc etc. The location along the fence was chosen based on the fact that it was right above the trash can. So I went outside this afternoon (after getting up at the crack of noon), and there on top of the trash can, was a rat hanging by the neck in the trap. A pair of plastic gloves later, the trap is ready to be set again tonight. NOTE: We only leave it set during the night to prevent less pesterous animals as Squirrels from feeling the mighty wrath of Victor the Rat Trap. 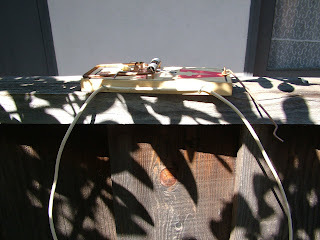 We also have a trap in the garden (figure out why we finally started trapping the rats yet? ), which has managed to get one of the rats as well. As far as I've seen, there is at least one more rat out there, so we'll keep setting the traps for now. do you have stats for my ip? wait no, that doesn't really work since i visit your site from work too. I was just saying you should totally look at how often i come here nowadays. I must have refreshed like 20 times during work today. And now it's 6:39 AM and I'm stopping by. rofl.